Very sad news over the weekend to hear of the death of John Julius Norwich, writer, diplomat, broadcaster, father of Artemis Copper (Paddy’s biographer), and friend of Paddy and Joan. Thank you to AJ for sending me this link to his final article for the Oldie magazine. Like John Julius, it was Paddy that led me to my interest in Byzantium, although my Byzantine output is nothing like the wonderful three volume history of Byzantium that John Julius wrote. First published in The Oldie, 1 June 2018. A new show at the British Museum – about three great lovers of Greece – takes me right back to the 1950s. The English painter Johnny Craxton (1922-2009) was a joy – the only dinner guest we ever had who came on his motorbike and left his leathers in the hall. He always came on his own; we were all intrigued by the idea of his long-term boyfriend, whom we never met. I think Johnny saw Greece as a larger Crete – just as Neville Chamberlain was always said to see Europe as a larger Birmingham. Johnny loved Crete with passion. The Athenian painter Nikos Ghika (1906-1994) provided me with my first breath of Greece in the summer of 1954, when we went to stay with him in his lovely old house on the island of Hydra. Also staying there were Paddy and Joan Leigh Fermor. Ghika later designed the serpentine pebble mosaic floors at Kardamyli – the Leigh Fermors’ enchanting house in the Mani. It was Paddy that I knew best of the three. Our friendship lasted from the 1950s until his death in 2011 at the age of 96. In the spring of 1955, when we were living in Yugoslavia – I was working at the British Embassy – a letter arrived from my mother. She had been offered a caique for a fortnight’s sail among the isles of Greece. Paddy and Joan Leigh Fermor were coming; could we come, too? At the end of August, we drove down from Belgrade to Athens, and boarded the Eros at Piraeus. It was my first time in the Aegean, and my best. Paddy lived and breathed his beloved Greece – fluent in its language, encyclopaedic in his knowledge of its history, people and literature. And nobody has ever carried his learning more lightly. As we sailed from island to island – and, in those days, there were almost no tourists, and I can’t describe what a difference that made – he talked about Greece, Greek beliefs and traditions, about Byron and the Greek War of Independence, about those monstrously magnificent Greek heroes – men such as Mavromichalis and Kolokotronis, whose names roll so satisfactorily across the tongue – and about the Greek Orthodox Church and its quarrels with the West over words such as ‘filioque’ and ‘homoousion’, his talk taking in all the mystery and magic of the Byzantine world. Twenty years later, I was to write a history of Byzantium myself; but I doubt whether, had it not been for that fortnight on the Eros, I should ever have done so. One day we were in a taverna on Santorini. Britain and Greece were then at the height of the Cyprus dispute and Paddy was, of course, firmly on the Greek side. Suddenly a member of the party at the next table, hearing us speaking English and being slightly drunk, launched into a stream of anti-British invective. We pretended not to notice. Then, suddenly, he and his companions burst into song. We leapt to our feet while he, naturally knowing all the words, sang them at the top of his voice. The mood of the other table changed immediately; and they were still more impressed when he continued with all the following verses – solo by now, since no one else knew them. Abject apologies followed: the ouzo went round once more, and we all departed friends. It was characteristic of Paddy that, when he and Joan decided to build themselves a house in Greece, they chose the remotest corner: Kardamyli, at the far end of the Mani, the second of the three peninsulas that form the southern coast of the Peloponnese. And oh, how they loved it. By November 1969, with its vast supply of bookcases, a huge desk and plenty of room to pace over a stone floor, the ‘powerhouse for prose’, as Paddy liked to call it, was ready at last. The two books describing his teenage walk across Europe, A Time of Gifts and Between the Woods and the Water, were both written there, together with hundreds of letters, articles and the jeux d’esprit which he so loved, and of which he was such a master. But those dread enemies procrastination and distraction were always hovering behind him, tempting him away. And as we shall see, they were to get him in the end. Kardamyli was a huge success. It became the epicentre of Paddy’s world. For the first time, at 54, he had a home of his own. He continued to travel around Europe to see his innumerable friends, but it was here, I feel quite sure, that he was happiest. Outside Europe he was seldom tempted to roam. Except, surprisingly, for the Caribbean. A year or two after the war, he and Joan were persuaded by their old friend (and mine) Costa Achillopoulos to accompany him on a longish tour of the islands. The result was Paddy’s first book, The Traveller’s Tree, which was published in 1950, and also his second, The Violins of Saint-Jacques, an exquisite little novella which was his only venture into fiction. Later, Paddy discovered that Ferdinando’s son Theodore had returned to England and had settled in Stepney, where he left a posthumous daughter baptised with the typically 17th-century name of Godscall Palaeologus. She may have married, and had countless children; but, for the time being, this little girl in Stepney remains the last authentic descendant of the Palaeologi, the last imperial family of Byzantium. Conosce Gian Peel, con sua giacca tanta grigia? Con suoi cani e suo corno la mattina. I have an idea – I hate to have to say it and desperately hope I’m wrong – that Paddy’s last years were not as happy as the rest of his life had been. He missed Joan desperately after she died in 2003, he was getting old and he gradually had to face up to the fact that he would never complete the third volume of the story of that glorious European journey in his early youth. He produced bits and pieces for it by the dozen, but something always prevented him from organising them, connecting them and making them into a single coherent document. It was, I suppose, a kind of writer’s block. He would seize on anything – letters, articles, translations, those ingenious word games he so loved – rather than face one of two facts: the first, that he must finish the job; the second – far worse – that he couldn’t. Eventually he knew that the second was the truth. When he came to London, people would say breezily, ‘How’s Volume III coming on?’, little realising that they were driving a dagger through his heart. Volume III is not entirely lost. The Broken Road, compiled by Colin Thubron and Artemis, breathes Paddy through and through. And anyway, he has left us so much more to revel in. As a travel writer, he was surely in a class by himself. But he was much more than a travel writer; he was the most extraordinary literary – and social – phenomenon I have ever known, and I am proud to have been his friend. This entry was posted in An Adventure: Paddy's Biography by Artemis Cooper, Paddy's Friends and tagged Artemis Cooper, Diana Cooper, John Craxton, John Julius Norwich, Nikos Ghika, Patrick Leigh Fermor on June 4, 2018 by proverbs6to10. 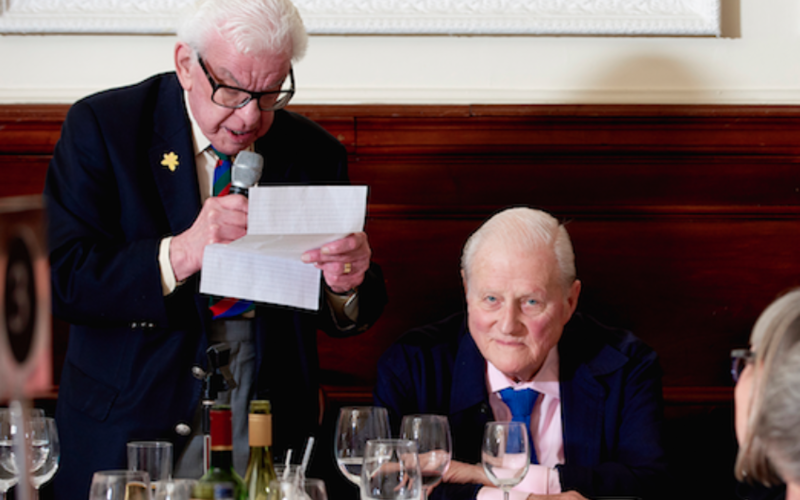 Many blog readers and members of the PLF Society were privileged to her John Julius Norwich give a very personal account of his memories of Paddy at the Hellenic Centre in London on 10 November. My account of the evening is here. That was the beginning. My parents saw quite a lot of Paddy and Joan – whom my mother thought looked just like Joan of Arc, except that Joan of Arc didn’t wear sun-glasses – in the next year or two. I was at Oxford at the time, and I remember seeing them once or twice during vacations, and being invariably knocked sideways – as everyone was – by the sheer brilliance of Paddy, and the glorious fun of him. Every time he walked into a room it was as if the sun had come out; never have I laughed more uncontrollably round a luncheon or dinner table, and as for his erudition, never have I met anyone who knew so much about everything under the sun, yet wore his learning so lightly. There seemed to be no language he could not speak, or indeed sing songs or recite poetry in: French, German, Italian, Spanish, Greek and Rumanian for a start, but there were probably several others as well. Then, in the summer of 1955, a wonderful thing happened. By then I had joined the Foreign Service. My first wife Anne and I were by that time living in Belgrade, where I was Third Secretary at the British Embassy. Another letter arrived from my mother. She had been lent a Greek caïque by the ship-owner Stavros Niarchos for a fortnight’s sail through the isles of Greece. Paddy and Joan were coming; could we come too? As far as we were concerned, it was a question of “can a duck swim?” At the end of August we drove down from Belgrade – which in those days had no airport – to Athens, and thence to the Piraeus, where we boarded the Eros. It was my first time in the Aegean, and Paddy gave it a whole new dimension. It was the first time I had seen him, as it were, on his home ground, and it was wonderful. He lived and breathed his beloved Greece – fluent in its language, encyclopaedic in his knowledge of its history, its customs and its literature. But nobody – and that was the wonder and joy of him and – I know I’ve said this before – nobody has ever carried his learning more lightly. His conversation was consistently dazzling. As we sailed from island to island – and in those days there were virtually no tourists, and I can’t begin to tell you what a difference that made – he talked about Greece, about Greek history, about Greek beliefs and traditions, about Byron and the Greek War of Independence, with those monstrously magnificent Greek heroes – men like Mavromichalis and Kolokotronis whose names roll so satisfactorily across the tongue – and about the Greek Orthodox Church and its quarrels with the west over more of those words, like filioque and ͑ομοούσιον; but his talk roamed far wider than that, taking in the whole eastern Mediterranean and, in particular, Byzantium. Its vices were the vices of men who had ceased to be brave without learning to be virtuous…. Slaves, and willing slaves, in both their actions and their thoughts, immersed in sensuality and in the most frivolous pleasures, the people only emerged from their listlessness when some theological subtlety, or some chivalry in the chariot races, stimulated them to frantic riots…. The history of the Empire is a monotonous story of the intrigues of priests, eunuchs and women, of poisonings, of conspiracies, of uniform ingratitude, of perpetual fratricides. Strong words indeed – although to modern ears that last sentence makes Byzantine history sound not so much monotonous as distinctly entertaining. But that long campaign of denigration continued well into the twentieth century. It was only in the time of which I’m speaking – the fifties – that the writings of people like Robert Byron, David Talbot Rice and Steven Runciman, together with the new-found ease, speed and relative comfort of travel in the Levant, made the glorious heritage of the Byzantine Empire at last generally accessible. Now, thank heaven, the Empire has come into its own again, and is seen as a worthy successor to the two mighty civilisations which it followed and so beautifully combined, the Greek and the Roman. The trouble was, for most of us, that we knew so little about it. Those old attitudes died hard. During my five years at Eton, the entire subject was the victim of what seemed to be a conspiracy of silence. I can’t honestly remember Byzantium being once mentioned, far less studied; and so complete was my ignorance that I should have been hard put to define it even in general terms till I went to Oxford. And, for heaven’s sake, why? After all, it was not even the successor, it was that same old Roman Empire of Augustus and Tiberius and Claudius and the rest, which continued to exist in its new capital of Constantinople for another one thousand, one hundred and twenty-three years before it was finally captured by the Ottoman Turks on that fateful day, Tuesday 29 May 1453, after one of the most heroic sieges in all history. It was Paddy and Paddy alone who revealed to me its mystery and its magic, although he also recommended to me, among much else, that I should read an extraordinary book by Robert Byron, The Byzantine Achievement, which that most precocious author wrote when he was twenty-five. I read it with utter fascination, and ended up completely captivated. When I got home I devoured every book I could find on the subject, and the following year Anne and I drove to Istanbul for a week. Twenty years later I was to write a History of Byzantium myself – three volumes of it, which were necessary if I was to cover more than a millennium; but I very much doubt whether, had it not been for that fortnight on the Eros, those three volumes would ever have been written. Bells clanged; semantra hammered and cannon thundered as the Emperor stepped ashore. Then, with a sudden reek of naphtha, Greek fire roared, saluting in a hundred blood-red parabolas from the warships’ brazen beaks….. In the packed square of Constantine, a Serbian furrier fell from a rooftop. An astrologer from Ctesiphon, a Spanish coppersmith and a money-lender from the Persian Gulf were trampled to death; a Bactrian lancer fainted and, as we proceeded round the Triple Delphic Serpent of the Hippodrome, the voices of the Blues and Greens, for once in concord, lifted a long howl of applause. The imperial horses neighed in their stables, the hunting cheetahs strained yelping at their silver chains. Mechanical gold lions roared in the throne room, gold birds on the jewelled branches of artificial trees set up a tinkling and a twitter. The general hysteria penetrated the public jail: in dark cells, monophysites and bogomils and iconoclasts rattled their fetters across the dungeon bars. High on his Corinthian capital, a capering stylite, immobile for three decades, hammered his calabash with a wooden spoon…. This entry was posted in A Time of Gifts, An Adventure: Paddy's Biography by Artemis Cooper, Paddy's Friends, Volume Three - The Broken Road, Words Of Mercury and tagged Artemis Cooper, Diana Cooper, John Julius Norwich, Patrick Leigh Fermor, Patrick Leigh Fermor Society on January 20, 2016 by proverbs6to10. I am grateful to John Stewart who sent this to me. Adrian Daintrey was a great fried of Diana Cooper and produced a portrait of Paddy in Cretan costume. I cannot find an image of that online. If anyone has one please do forward it. This entry was posted in Obituaries and tagged Adrian Daintrey, Diana Cooper, Patrick Leigh Fermor on January 22, 2012 by proverbs6to10. 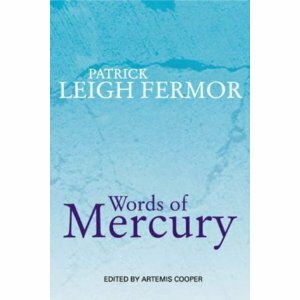 Paddy Leigh Fermor has lived one of the great picaresque lives of the 20th century. He left a minor public school under heavy clouds with no money and a penchant for wandering. From 1934, for five years, he sustained a lotus existence in eastern Europe and the Balkans, by charm, genteel begging and Byronic good looks. His parents must have despaired of him during this longest gap year in history. One of Evelyn Waugh’s characters observed in 1939: “It’s going to be a long war. The great thing is to spend it with friends.” Leigh Fermor pursued this policy with notable success. His 18 months as a British agent in Crete made him a legend, not least for the kidnapping of the German General Kreipe, theme of the later film Ill Met By Moonlight. After the war, Paddy resumed his leisurely course. One can no more imagine him occupying an office desk, queueing for the weekly envelope, than some marvellous beast of the African bush taking up employment as a security guard. He wandered the world until, in 1950, he suddenly produced a small literary masterpiece about the Caribbean, The Traveller’s Tree. Thereafter, at irregular intervals, he has written travel books and fragments of autobiography. On his visits to England, rural grandees and metropolitan hostesses fight for the privilege of his society. The home he created with his wife Joan on the south shore of the Peloponnese at Kardamyli is a small work of art in its own right, owing much to their pets, or – as he writes here – to four-footed “downholsterers and interior desecrators”. How he loves language and words! What is charm? In Leigh Fermor’s case it is an infinite curiosity about other people. He treats Bulgarian peasants and English dukes exactly alike. John Betjeman once spoke of Paddy “sitting there listening to you, his eyes sparkling with excitement as he waited to hear what you might say next”. Generosity of spirit is among his notable qualities. This entry was posted in The Traveller's Tree, Words Of Mercury and tagged Balkans, Byzantium, Crete, Diana Cooper, Evelyn Waugh, Ill Met by Moonlight, Major General Heinrich Kreipe, Patrick Leigh Fermor, Romania, Steven Runciman, The Traveller's Tree on April 20, 2010 by proverbs6to10.